Looking for the best and cheapest way to receive money from abroad? 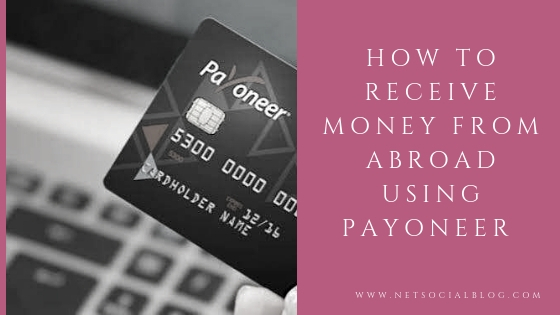 Here’s an article that shows you not just the fastest means; but also the best way of receiving money from Abroad using Payoneer. In this current era of Information Age; where there are Digital Skills which allows people to work remotely, there is the need for easier mode of payment also. This mode of payment has to be convenient for both parties – the client and Digital worker so there wouldn’t be any hassle in their mode of transaction. While there are several ways that which you can receive money from abroad; one of the best method to easily start receiving payments world wide is Payoneer. Whether you are a business owner, professional or freelancer; Payoneer offers you multiple ways to get paid online by your international clients and global marketplaces – quickly, securely and at low cost. All you need to do is Signup For a Payoneer Account Here FOR FREE and start collecting Payments from anywhere in the world. Immediately you sign up for the Payoneer account; you will be given an IBAN (International Bank Account Number) which you can use to receive money from abroad. This IBAN is automatically linked to your account such that when payment is made from abroad to your account; it is automatically credited to your Payoneer account. Having known how to receive Funds; you might want to ask about how can you Withdraw your Money From Payoneer to your local bank account. There are two ways that which you can withdraw your Payoneer funds. And that’s all you need to know about the basics of using Payoneer to receive money from Abroad. From the Author’s Desk: While there are several ways of receiving money from Abroad such as; WesternUnion, PayPal, Transferwise, and co. Payoneer seems to be the one you can easily setup within the comfort of your room likewise withdraw to your local bank.